Jon Earl dug deep for Northants. Northants’ hopes of returning to Skegness next month to defend the Adams Trophy inter-county championship are now out of their hands. Despite collecting 18 points from their visit to Hunts on Saturday, Suffolk’s 22-point ‘full house’ against North Essex puts them in the driving seat with a two-point advantage and one match each to play. Northants are at home to North Essex at Whittlesey Manor on Saturday, where maximum points will be the order of the day, but with Suffolk away to bottom-of-the-table and winless North Cambs, the omens are not good for the reigning champions. In the 170-147 victory over Hunts at Brampton, captain Fred Richardson reshuffled his team to maximise the opportunities at his disposal, and while overall victory was never in doubt, pressure mounted on every rink to deliver their respective two points to keep their championship hopes alive. Rinks skipped by Lee Welsford, Peter Brown and Tristan Morton rarely looked likely to concede their contributions, while Jon Earl’s rink dug deep over the last six ends to win 28-26 after trailing by three shots in the closing stages. Whether or not the respective 27-31 and 25-33 losses by the usually dependable rinks skipped by Graham Agger and Martin Welsford will prove crucial, only time and the record books will tell. The Newton Trophy team found the conditions to their liking at St Ives, where they swept to a maximum 22-point haul against Hunts with a crushing 221-133 victory. For the third successive match, Bob Warters, Cliff Watson and the outstanding Peter Jessop took the rink honours with an overwhelming 47-11 victory to extend their season’s unbeaten run going into this Saturday’s final game against North Essex at Parkway. Steve Roden, John Holroyd, Graham Agger lost 27-31. Nick Wilkie, Simon Law, Tristan Morton won 35-19. Stephen Harris, Martyn Dolby, Jon Earl won 28-26. Neil Wright, Tony Belson, Lee Welsford won 29-21. Roger Stevens, Paul Bailey, Martin Welsford lost 25-33. Adam Warrington, Barry Lawrence, Peter Brown won 27-17. Jim Ruddy, Phil Afford, Brian Swann won 41-25. Andrew Grief, Peter Holmes, Fred Addy won 36-26. Jack Corney, Malcolm Squires, Roger Strong won 44-20. Les Sharp, Michael Humphreys, Mick Duell won 32-26. Bob Warters, Cliff Watson, Peter Jessop won 47-11. Joe Martin, Mick Greaves, Brian Bassam won 27-25. The Northants women’s Donald Steward team concluded their inter-county championship campaign with away defeats by North Essex and Norfolk, collecting just two points from a possible 36. That one rink win came from Sue Moir, Vie Hatch and Sheila Craig in the 105-122 defeat by Norfolk on Monday, but Northants failed to register a single point in their 83-136 defeat by North Essex. There was better news for the Silver Jubilee Vase team who defeated their North Essex opponents 116-98 in the Silver Jubilee Vase to collect 14 points, the rink wins coming from Pearl O’Brien, Wendy Harrold and Stella Dale. However, they ended their programme with a 102-128 defeat by Norfolk, the rink wins coming from Judy Ford and team captain Ann Cooper. Kathy Browning, Fiona Richardson, Norma Squires lost 20-22. Shirley Suffling, Doris Flowers, Julie Masters lost 17-18. Sue Moir, Vie Hatch, Sheila Craig lost 10-30. Ann Cullingworth, Jessica Phillips, Joan Padley lost 17-32. Liz Barr, Chris Ford, Hazel Bass lost 19-34. Kathy Browning, Linda Toms, Norma Squires lost 14-34. Shirley Suffling, Doris Flowers, Julie Masters lost 17-22. Sue Moir, Vie Hatch, Sheila Craig won 35-15. Ann Cullingworth, Jessica Phillips, Joan Padley lost 23-36. Liz Barr, Chris Ford, Hazel Bass lost 16-25. Carol Warters, Rita Mace, Pearl O’Brien won 30-17. Margaret Linnell, Janet Duffy, Val Du’Kett lost 15-24. Glenys Edwards, Viv Hempsell, Wendy Harrold won 27-22. Marlene Osbourne, Joyce Needham, Stella Dale won 25-13. Judy Cooper, Peggy Birch, Gill King lost 19-22. Carol Warters, Pat Collicott, Judy Ford won 23-13. Margaret Linnell, Janet Duffy, Val Du’Kett lost 16-29. Glenys Edwards, Wendy Harrold, Viv Hempsell lost 13-40. Marlene Osbourne, Joyce Needham, Stella Dale lost 23-24. Peggy Birch, Gill King, Ann Cooper won 27-22. 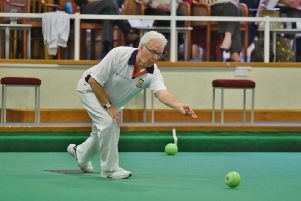 In the women’s county competitions, Sheila Craig (Conservative), the runner-up last year, returns in the two-bowl singles final at City of Peterborough on Sunday week to play Fiona Richardson (City of Peterborough) following wins over Chris Ford (Ketton) and Sharon Bailey (Blackstones) respectively.